Excellent achromatic lenses with a photo-printed precise scale. Focusing ring. Accuracy and low prices. Circles: 0.1 to 3.0mm dia. Circles: 0.1 to 1.0mm dia. and .005 to 1/16" dia. Radius: 0-90° (0.1 and 0.5mm divisions). Line thickness: .001" and .002"
Screw Threads: 50, 18, 20, 8, 16, 32, 24, 28, 14 per inch. Line Thickness: 0.01", 0.02", 0.03"
A hand-held magnifier for measurement and inspection. Their construction make them ideal aids for anyone concerned with quality control, inspection, drafting, photography, etc. The clear base allows ample surface light to fall on the subject being measured and the eye lens can be focused to suit individual sight. 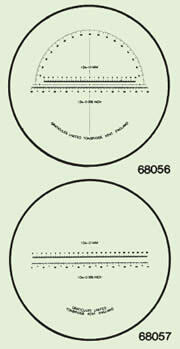 Interchangeable graticules fitted in the base ring permit a variety of measurements to be made quickly and accurately. Comes complete with a leather case. Composed of two plano convex lenses, separated by an air space. The image plane is between the two lenses. The top lens is adjusted to bring the graticule into focus. The F10 eyepiece, which fits most standard monocular microscopes, is specially designed to receive eyepiece graticules of 16mm diameter. This allows the graticule to be brought into sharp focus when superimposed on the object image, which is often difficult to achieve with fixed focus eyepieces. The graticule is held by a screw-on retaining ring and is easily removed for cleaning or replacement for another pattern. Composed of a convex lens and an achromatic lens. The image plane is below the lens elements. The use of an achromatic lens provides a larger field of view, better color correction and substantial eye relief. The top lens adjusts to focus on the graticule. With high eye point (useful for spectacle wearers). Non-focusing wide field.